Are you seriously looking for a drone with outstanding camera quality? Then don’t worry, check the latest DJI Inspire 1 Pro Black Edition with magnificent camera quality, i.e., 16 megapixels. The Zenmuse X5 can snap up to 16MP resolution which is absolutely suitable for enthusiastic photographers and for wedding documentary, videography. As this drone has some auxiliary features, it is not preferable for the beginners. It will be appropriate for the intermediate learners and experts of drones. The DJI Inspire 1 Pro black edition is a brand new quadcopter capable of capturing 4K video and transmitting an HD video signal to multiple devices straight out of the box. It is equipped with retractable landing gear and can capture an unobstructed 360-degree view of its camera. The camera has an integrated gimbal to maximize stability while minimizing the space. When there is no GPS signal available, Vision Positioning technology provides hovering precision. It has a facility of instant auto landing and takeoff with a single tap. Hence, with its splendid controlling features and high-quality HD camera, we can say that it is exactly suitable for the aerial filming and videography. DJI is a Chinese company started in 2006. It is a well known leading drones company. The headquarters of DJI are located in Shenzhen, started as a small start up in 2006 it became a global giant drones manufacturing industry. The company has direct access to the supplier, and it has worldwide branches in U.S, Netherlands, Japan, Germany, Beijing and Hong Kong. It manufactures unmanned aerial vehicles for aerial photography and videography, pro gimbals, flight platforms, cameras, propulsion systems, camera stabilizers, and flight controllers. Recently DJI launched the DJI Inspire Pro one black edition with all the latest technologies equipped with it and steals the heart of customers with its outstanding features. In this review, As an enthusiastic drone lover, I want to give the complete details about the DJI Inspire 1 pro, on considering my buying experience of this product. Firstly, It is a Ready to fly drone does not require any major soldering. The Inspire 1 has a high-quality Zenmuse X5 gimbal camera with 16 megapixels cam quality. This drone is mainly suitable for high-end photography and videography as it has a 4K camera and 3-axis stabilization gimbal. Built-In Wifi and GPS gives us remarkable flying experience. The HD camera of Inspire 1 Pro gives us the real-time flying experience and gives us the perfect shots. Auto Takeoff and landing are available with just a single tap. Tap once to take off and your Inspire 1 Pro will hover and ready to start filming. Then tap once to make it transform into landing mode. It runs on the live map and can be traced to know the recent path. Finally, We can say that this is a high-performance quadcopter with all the advanced features. Lets us discuss the features in detail. It has many advanced features like Zenmuse X5 4K camera and 3-axis stabilization gimbal, auto landing. We can say goodbye to all the frustrating setups and installations. The Zenmuse X5 is perfectly compatible with the DJI Inspire one pro, and it is a Ready to fly drone which brings a level of control and convenience that only a fully integrated system can provide. Low latency, HD downlink are powered by an enhanced version of the DJI Inspire 1 Pro provides an additional beneficial feature. It also has access to dual controllers mode. DJI’s Optical Flow technology uses a specially designed camera and sonic waves to provide the stability to indoor as GPS outdoor does. This technology allows the Inspire 1 pro to hold its location when the controls are released, and it quickly responds to pilot commands whenever GPS is unavailable. It has a manual mode controller where we can change all of the camera settings, including ISO, White Balance, and Exposure ensuring every shot looks to be exactly perfect and the way we desire. 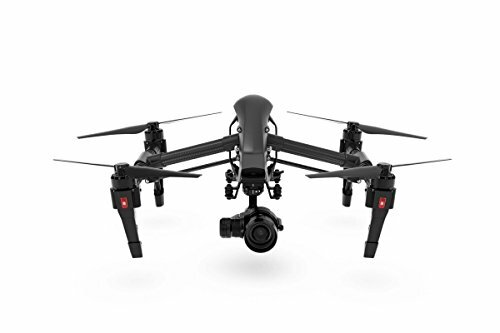 The Inspire 1 Pro gives a sleek look, and the aerodynamic airframe helped to reduce resistance for better performance and increased the lifespan of the battery. The battery constantly supplies the flight computer with remaining voltage. Using unique algorithms the computer provides the estimated remaining flying distance and time to return home. The flight time of this drone is 15 minutes. Everything from the manual camera controls to flight auto takeoff, and landing can be accessed via the Inspire 1 pro-Mobile app. Just download the app from the play store and app store and access the control. The DJI Inspire 1 pro quadcopter is a Ready to Fly Drone; It just requires small assemblings. The essential things are just adjusting the propellers and attaching the Zenmuse X5 camera. Finally, insert the fully charged battery into the drone. Hence, We can start our first flight. Insert the Intelligent Flight Battery into the battery compartment. Power on the Remote Controller and the Intelligent Flight Battery. Battery must be fully charged before using it for the first time. If you have purchased the dual remote controller version, you should use the Master remote controller to deactivate Travel Mode. Install the gimbal and Attach the Zenmuse X5 camera. Place the aircraft on the smooth and reflective surface. Control with remote controller and enjoy the safe flying. Auto landing and take off. The aerodynamic design which increases the battery life span. Never charge your battery in a flammable environment, i.e., near to stove and fire. Do not remove the Micro SD card when the flight battery is ON. Place your quadcopter away from the children. Don’t fly your drone in a crowded place. If you want to fly to the city, you must follow the FAA designated flight limit i.e. 400 feet. Keep all your belongings away from the drone rotors when the power switch is turned ON. Shut down the remote controller when it is not in use. Remember to remove the battery as soon as your flight time is finished. Don’t disturb the drone once the engine is started and it is Ready to fly. Never use your battery in any other drones. Always have a glance on the user manual before you start your ride. Follow the rules and have a safe fly. DJI warranty policies are different when compared to other products. DJI guarantees that subject to the following conditions, refund and replacement can be requested within seven calendar days of the delivery date and replacement can be claimed within 15 calendar days. Please contact DJI or the authorized distributor of DJI from whom you purchased your product for more details. Not for beginners. Excellent platform. There are/were some battery issues, but DJI is on top of it. This camera system IS an MFT system and therefore opens up new doors of capabilities beyond the Phantom series. I purchased it from CAMROSE who are in NYC, and they are a DJI dealer. They back up what they sell and always seem to have a great inventory. The product was very well made. I did not expect that this UAV is easy to fly. I have built my fav and used another brand, and i am surprised how this thing can fly. The camera system and the communication between UAV and remote control were good. 1. What is the Flight time? The flight time is around 15 minutes. 3. What is the Camera Resolution? So, Finally, If you are skillful in flying drones than this DJI Inspire1 pro black edition is highly recommended for you. The Zenmuse X5 camera gives us a fabulous experience in capturing, HD images and videos. I am very satisfied with this Inspire 1 pro quadcopter and with its outstanding features. According to my experience, this drone is highly suitable for aerial photography and videography. Therefore it can be mainly recommended for wedding photography and filming. Hence, I feel my review is helpful to you and have a joyful flying.